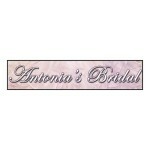 Toni Esposito, master artisan with over 40 years of gown and alteration experience is the owner of Antonia’s Bridal in the quaint town of Pitman, NJ. Toni’s shares her bridal expertise and experience with the Bride-to-Be during the initial consultation and all along the way. This personal attention helps ensure the perfect dress for the bride’s special day.